A software update to the Super Mario Maker game for the Wii U console adds some additional items, modes and features to the critically acclaimed game, making it even more fun to create, share and play levels from all around the world. Fans of the Super Mario World game for the Super NES fondly remember the key item, which, when grabbed, unlocks keyholes and grants access to new parts of the level. With this new free update to Super Mario Maker, both the key and locked doors with keyholes will be added to the game. Accessed by shaking the P-Switch and Door items, respectively, the key and locked doors can be used together to create challenging new levels. The key can even be attached to enemies, forcing players to defeat an enemy to retrieve the key and move forward. With this, mandatory boss battles are born. When players shake a coin in Create Mode, it will now change into a Pink Coin. If a player collects all the Pink Coins in a course, a key will appear. By using the key, locked door and Pink Coins, players can expand imagination and create unique puzzle solving levels. A new skewer obstacle will also be added to the game. Originally featured in Super Mario World, this huge, foreboding column comes slamming down in a level and appears in a course by shaking the Thwomp item in Create Mode. Players looking for a serious challenge are in luck, as after downloading the free update, a new “Super Expert” difficulty will be added to the 100-Mario Challenge. This new difficulty pulls random courses that have been categorized as being “Super Expert” after the courses are created. 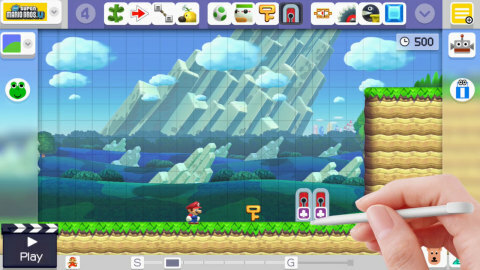 The game update also brings new additions to the Super Mario Maker Bookmark website, which lets users sort and search for levels using a smart device or browser. Super Mario Maker World Record players will now be shown on the website. Recently, there have also been some new costumes added to the game, including the always smart and sometimes zany Professor E. Gadd from the Luigi’s Mansion games. Fans of Daisy can play through the Adventures in Sarasaland Event Course and also get the Daisy costume. Players should check Event Courses often for new levels to play. Super Mario Maker has a staggering 6.2 million different user-created playable courses, which in turn have been played more than 400 million times as of Jan. 27. For more information about the game, visit supermariomaker.nintendo.com/.